William OLIVER Before 1804 He died "unchurched" in 1873 at Killynure . Thomas OLIVER Before 1813. Never married and died in 1867. He farmed with his brother William. James OLIVER Born after 1815 & died before 1825. Andrew Bradford OLIVER After 1821- After 1874. Benjamin OLIVER's Parents: The records in Peerage and Baronetage allege that William OLIVER was the father of Elizabeth OLIVER - not her grandfather. Initially I stuck with that since I had little else to go on, but all the family sources didn't agree. They alleged that Benjamin OLIVER was actually her father (and therefore husband to Elizabeth BRADFORD). Fortunately the inscription on the headstone naming William as Benjamin's father made a better fit with all the other evidence from leases and other such documents. And that's what I am now sticking with. To the memory of Benjamin Oliver of Killynure who departed this life July 1st aged 66 years. This [?] of respect was erected by his eldest daughter AD 1883. Here also are the remains of his parents William and Elizabeth Oliver. Of his sons William Thomas and James. Of his sister-in-law Jane, wife of William. And of his sister Frances Oliver and Mrs. Elizabeth Vance. The question is which of the William OLIVERs in the region at this time will turn out to be the father of our Benjamin OLIVER. Given the small population as well as the even smaller numbers of people who were of their likely class and faith, the field is narrowed considerably. One possibility is that he was the William OLIVER who was born in 1727 and baptised in Armagh Presbyterian. His age of 38 would be a fit for being the father of Benjamin as would his residence in Co. Armagh. So would his religious affiliation. It is then possible (and all of this is in the territory of hunches here - but the various bits seem to fit) that he switched his faith allegiance (likely not the first nor the last time for the OLIVERs) as there is a 1757 record of a William OLIVER marrying an Elizabeth STEEL in the Church of Ireland in the City of Armagh, St. Patricks. Again, the geography is a good fit as this William OLIVER was from the townland of Farmacaffley in the Parish of Lisnadill - an area of the parish where there are clumps of OLIVERs for several generations. The first name of his wife is also a good fit with the first name given on the tombstone as well as the fact that the STEELE family was well established in Co. Monaghan where the OLIVERs of Benjamin's fathers generation seemed to have had considerable business dealings. After all this poking about, Blin BROWN's records (she was a grand-daughter of Benjamin OLIVER & Elizabeth BRADFORD) have proven to be as accurate as any. Benjamin Oliver bought Killynure & married Elizabeth Bradford, daughter of Thomas & Elizabeth Breakey Bradford of C.nore [Cavananore] & begot, Thomas, William, Eliza, Andrew Bradford & Mary Jane. Thomas & William died unchurched. Eliza married David Jackson. Andrew Bradford married a Miss Norris (?). These Olivers came over from France originally & settled around Armagh. At one time they owned lots of landed property Killylea & Lisnadill districts. They had Dublin connections too. Killynure: 1806 is the date of the earliest lease that I have that connects a Benjamin OLIVER to Killynure. At the time of the lease, he was living at Ennislare (a townland immediately south of Farmacaffley, the residence of the William OLIVER who was most likely his father). Interestingly, although there are several dozen listings for Killynure, Killinure and Killenure in the PRONI records of Freeholders, the only one that is in Co. Armagh is the one that is associated with our Benjamin OLIVER - and what is even more curious is that no other names are connected with it. That being said, I have found evidence in the Deeds registry. A 1743 deed mentioning Killynure was signed between a PRINGLE and an ENERY. This townland was included along with eight others and I have had suspicions for some time that it might have been known prior to this as part of "The Seven Tates". Regardless, the land title was then transferred from PRINGLE to OLIVER (although the memorials of deeds add a bit of confusion here: SEE: 1806 - PRINGLE-OLIVER and 1807 - PRINGLE-OLIVER ) It seems that Benjamin OLIVER was committed to farming at Killynure as there was a record in 1816 of him planting 270 trees: ash, larch & firs (SEE: 1816 treeplanting ). It is a mystery how this squares with another snippet from Blin: I know he bought Killynure from a man called Dobbin who had to leave the country - for its good - & on the condition that if ever this Dobbin man wanted it again, he was to get it back for the same price paid. Therefore the Olivers never did anything to improve the place. (SOURCE: 1938 letter). The lands of John DOBBIN were on the south east corner of the leased part of Killynure that Benjamin OLIVER leased. In 1892 a wife of a William OLIVER granted in her will to Mary Anne MULLEN of Killynure, spinster effects of ₤54. Bearing in mind that Benjamin OLIVER's son William "died unchurched", we cannot rule him out as the partner of this Mary OLIVER since unchurched is not the same as unwed. NOTE: a death certificate for a Mary OLIVER who died abt 1892 would be very helpful - there is a Mary OLIVER b. 1822. The Revision books show Mary Anne MULLEN sr. had a lease for 6 acres and a very modest building(s) (value 10s) in 1892 that had previously been leased by Sarah and Mary DONAGHY. They are on lot #1. It is curious that 1892 is also the date of the death and will of Mary OLIVER “wife of William OLIVER”, who left her lands at Killynure to Mary Anne MULLEN. Is it possible that Sarah DONAGHY was the out-of-wedlock daughter that Mary Anne MALLON had with a William OLIVER? Is it possible that Mary Anne MALLON aka OLIVER also had a daughter named Mary Anne MALLON? The revision Books show that in 1908, this lot was purchased in fee by Joseph MACKLIN. Transcript of will: 19 January 1892. Killynure. In the year of our Lord eighteen ninety too [sic] this is my last Will and Testmont [sic] by the Grace of God I bequeath my houses and farm and cattle cows and calves and all I am possessed of to Mary Anne Mullen Mary [X her mark] Oliver. Witnesses present: Robert Montgomery, Killnure. Owen Fegan Killnure. Affidavit of due Execution files A. Nelson. District Registrar. Will Annexed 23 Feb 1892. Killylea & Lisnadill & Ballyrea, Co. Armagh. According to various "memorials of deeds" and such, Benjamin OLIVER and his brothers did own leases in the parishes of Killylea and Lisnadill. Killylea is a townland in the parish of Tynan in the western part of Co. Armagh, near Co. Tyrone. Lisnadill is both a parish and a townland. 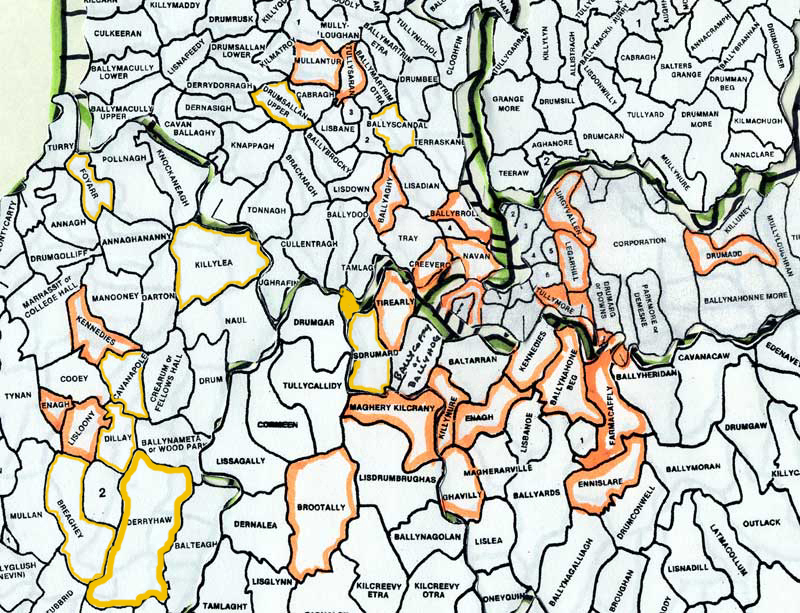 As a parish, it encompasses many of the townlands mentioned in leases involving the OLIVERs. I am constantly amending maps of these areas. A map of various townlands where I have found a concentration of OLIVERs can be viewed at :Map & Table - OLIVERs of Co. Armagh . Also, I have an early version of a map that I drew of Lisnadill . (NOTE: I need to revisit and revise) One challenge which still daunts me is figuring out all the various Benjamin OLIVERs. Ballyrea is in the parish of Armagh, slighly North-east of Killynure and is also a townland that had more than its share of OLIVER names such as Benjamin, David, and Joseph and seems to be the townland of origin for the OLIVER family members who were involved in the Laragh mills in Co. Monaghan. Lislooney. I am guessing that the Benjamin OLIVER who resided at Lislooney, Parish of Tynan, Co. Armagh was related to our Benjamin OLIVER, but I have yet to run that relationship to ground. The tithes indices of the 1820s have records of a Benjamin OLIVER not only at Lislooney, but also at the adjacent townlands of Cavnapole, Delea (I am guessing this is also known as "Dillay") and Breaghey. NOTE: This next section was written some time ago and the links between it and my known and proven ancestors are a little tenuous. Take it with a grain of salt - perhaps a great heap of salt! In 1766 Bryan Burns of Laragh demised to David Oliver of Ballyrea, C. Armagh, the corn mill called Lough Egish mill. Oliver was already in the linen trade in Co. Armagh. The corn mill seeminigly was changed into a beetling mill. It would appear that the concerngot into debt and was 'rescued' by D McTear who in the process received a lien on the property. When David Oliver died, there was some difficulty in settling the estate. In 1815, the Court of Chancry ordered that in consideration of outstanding debts being discharged, McTear should assign the bleaching mill and green, in their actual possession, to Oliver's sons Joseph, William and Benjamin. The bleaching operation was being worked on a reduced scale; part of the mill had been changed into a flax scutching mill and another into a corn mill. It only worked 4 months of the year in total. At Laragh, William Oliver had bleaching mills, a flax mill and a corn mill. "Beetling mill: 1/Water wheel 16 ft. diameter by 4 ft. wide buckets. Flax mill. 1/water wheel 16 ft diameter by 5.5 ft wide buckets. Corn mill. 1/water wheel 16.5 ft. diameter by 5ft wide buckets. Regardless of the ownership (which still needs more verification), these OLIVERs had hit hard times and there were financial disputes and hotly contested legal battles over the ownership of the mills. As far as Benjamin's financial fortunes were concerned, it probably didn't help that he died at age 66 before the legal issues were resolved. This was a decent enough age for the time, but his wife was some 20 years younger than himself and she died at age 40. The orphaned male children were not yet mature enough to take up the reins and the female children were younger still. This land was once part of the OLIVER estate. 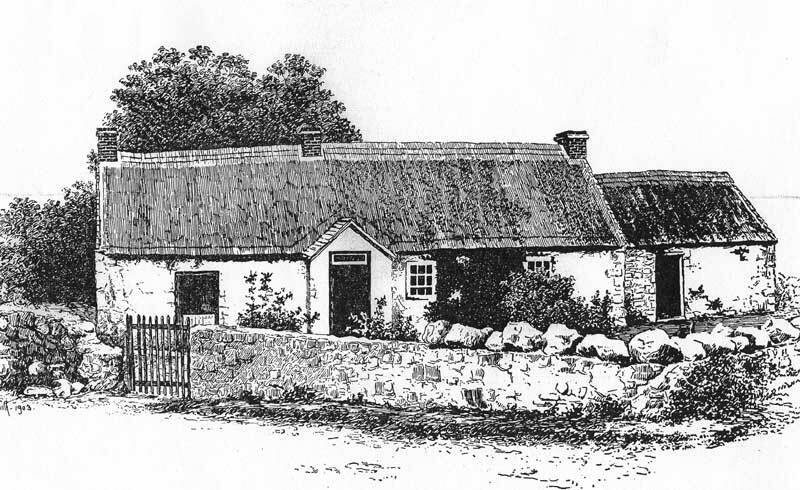 It is at the bend of the road just west of Killynure where there is a house called “Maghery”, outside the City of Armagh. It is now owned by Tommy O’HAGAN. 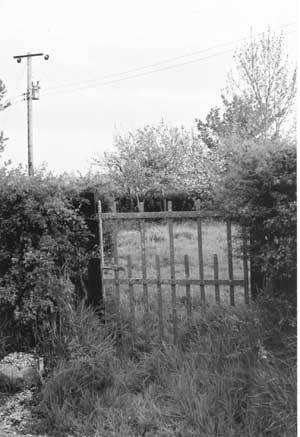 Just beyond this fence are flat stones which were once engraved and are the tombstones of various members of the Oliver family. Cows graze over and around them.